We cannot pretend that biases do not exist. They do. It is a natural part of us and because of decades of stereotyping and heuristic thinking, it is deeply ingrained. Biases can permeate the air of an organization, influencing everyday decisions and eventually deterring the organization’s ability to thrive in a hyper-competitive world. In the last decade, organizations have focused on identifying biases and have encouraged employees to make deliberate, conscious decisions. There exists a significant bias against women in the workplace. Women are expected to play nice at work and be communal, while men are rewarded for aggression. Women need to perform at a higher level for a promotion, while men are often promoted based on their potential for the higher role. It is not rare to see ideas from male employees getting instantly accepted while similar ideas from female employees being deliberated upon. At work, a female employee applying for an internal job posting (IJP) in a different location is most likely to be asked by her manager if she was ‘sure’ about her decision and what her family thinks of the same. Her male colleague applying for the same IJP will most likely not be asked to explain. Undermining female employees or second-guessing them could lead to hindering the best ideas from flourishing. Companies like PWC for instance, train their employees to identify ‘blind spots’ and become aware of unconscious bias. Bias based on language, religion, place of origin is toxic and is unfortunately prevalent across all Industry sectors in India from manufacturing to IT. The grapevine within organizations often revolves around promotions and career progression linked to Cultural bias. Cultural Bias exists even at the resume screening stage. A person with a fairer skin tone is preferred for customer facing or Managerial role. A person speaking a particular language is given preferential opportunities and promotions as compared a person from a different state. In an attempt to remove unconscious bias, companies like Facebook do not allow reasons like ‘culture fit’ as reasons for hiring. Instead, their interviews focus on whether candidates reflect their core values. This helps create an inclusive workplace where people are hired for their authentic selves and not for being similar to the existing employees. Physical disability is a facet of human diversity. Yet, those with disabilities are twice as likely to be unemployed when compared to those without disabilities. Amongst those who manage to get employed, they often feel discriminated against in the workplace w.r.t. opportunities for advancement. They are often overlooked for client facing roles even if they are competent. It is important to acknowledge that if one of the senses is lost all the other senses become sharper. Generational diversity is, even more, a challenge with younger generations (Gen Z) calling the shots in new fields like AI and get highly paid for as compared to their Gen Y seniors etc. Senior employees feel isolated when younger colleagues do not include them in conversations trending among st their generation. Lesbians, gays, bisexuals, and transgenders fear discrimination and backlash at the workplace for revealing their sexual orientation. There exists a negative attitude towards them. They are isolated and ignored by the others in subtle ways or still worse made fun of. Biases can lead to a hostile work environment for those who do not fit in. 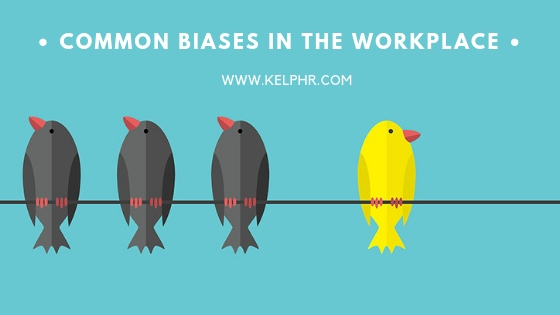 Thankfully organizations are progressively educating employees on the impact of common biases in the workplace and making the workplace more inclusive.